I like to have a browse in Poundland for potential Foodstuff Finds goodies. They are surprisingly good at getting some new products earlier than elsewhere, and they often have import goodies at reasonable prices. For example I picked up a large box of Reese’s Pieces for £1 while I was there. 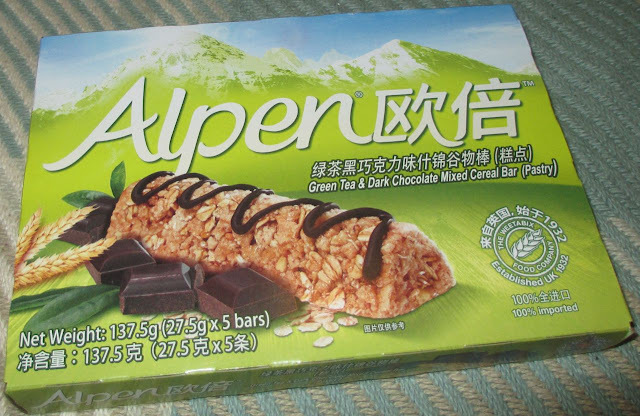 I thought these Alpen Green Tea and Dark Chocolate Cereal Bars were an import product when I saw them, there is clearly a lot of foreign writing on the box, so I popped a couple of packets into my basket to try. When I got home and took a closer look at the box I realised that these cereal bars were made a lot closer to home, here in the UK, with the intention of them then being exported to China. I can only assume that Alpen had excess this month and instead of exporting them they ending up in the local pound shop. Funny to think that these Green Tea cereal bars were made in Britain without them expecting to hit UK shelves. Green Tea is a big flavour in the East, with many products (including cakes) being flavoured with it fairly standardly over there. I opened up the packet to have a look at the bar. The bar isn’t pale green or anything, it just looks like a regular Alpen bar, with a neat drizzle of dark chocolate decorating the top. The bar is a nice texture, firm but bitty and the hint of herby bitterness from the Green Tea contrasts nicely with the sweet dark chocolate. I really enjoyed the flavour, it felt fresh and different and worked well. I’m not sure how the UK market will take to these bars, but I’d be grateful for a wider release of them here in the UK as it is so nice to see something so different work so well. So very different, and can't believe they are made in the UK!